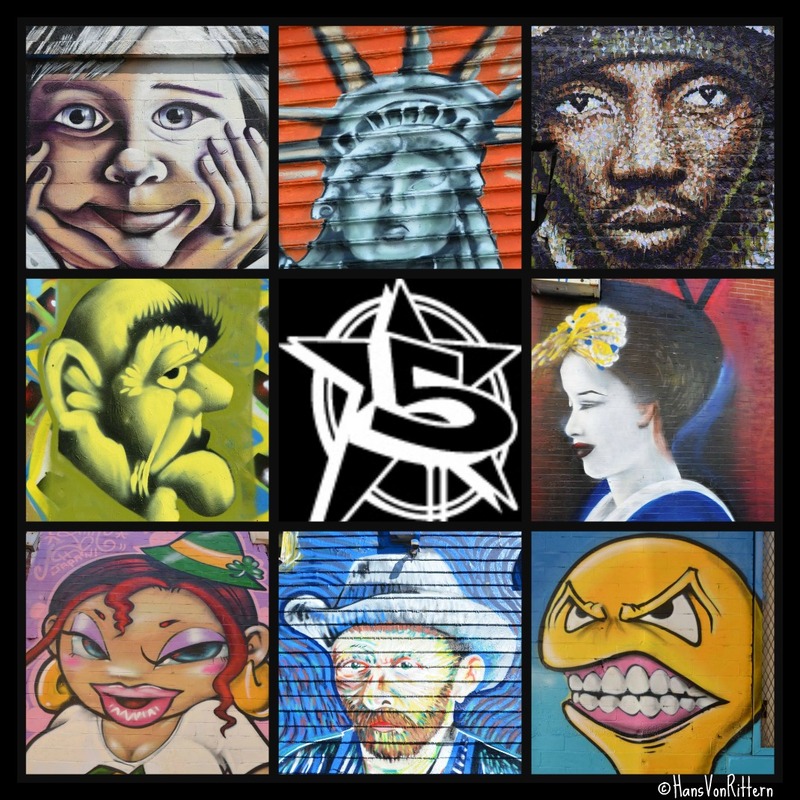 Photo of the day: THE CYCLE OF ART AT 5 POINTZ – Come see the magnificent art work for these last two days and celebrate with us that life and art always prevail. Artists and writers will be on the scene. 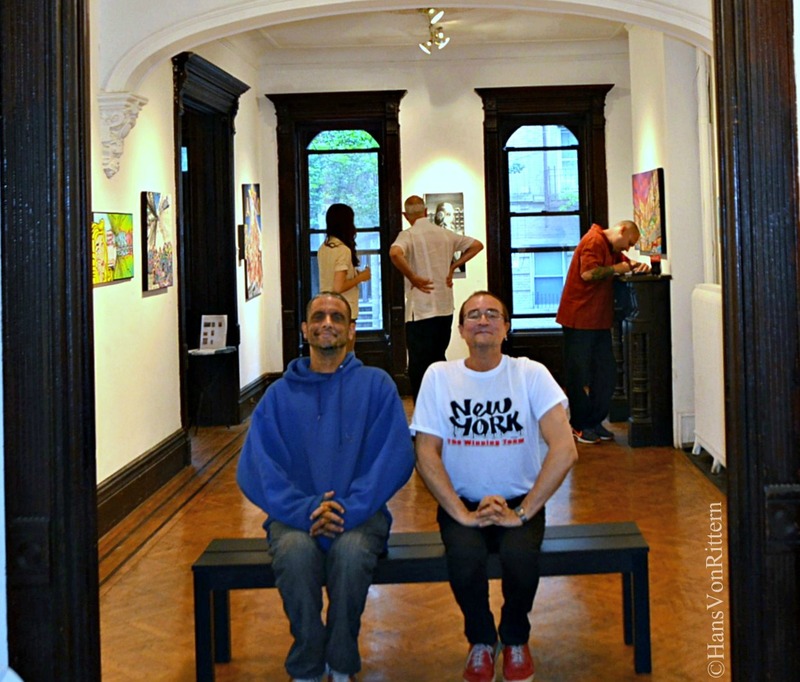 If you would like to see more expressions by great artists on canvas and in photographs (mine included) from today till this final weekend – come to the Jeffrey Leder Gallery this weekend and view the brilliant art by artists: Auks, Cortes, Hans Von Rittern, Jerms, Just One, Meres One, Poem, Shiro, See TF, Topaz, Zimad, all brilliantly curated by Marie Cecile Flageul! A catalog is available for sale as is all the art. 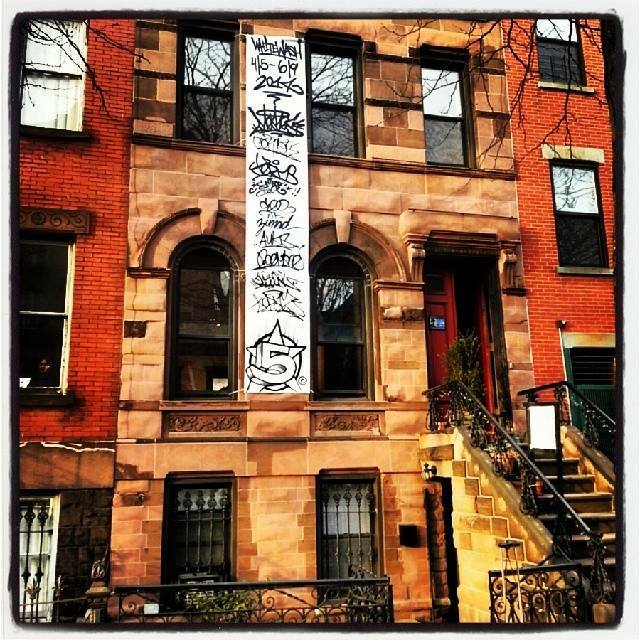 The Jeffrey Leder Gallery: 2137 45th Road, L.I.C. #7/G subway stop. One block away from 5 Pointz and PS1 Moma. Admission is free, open Saturday: 12-8pm. Artists will be present from 5-7 today! Photo of the day: ART IS TRA$H – This art work by street artist Francisco de Pájaro was discovered on a mattress late at night at 5 Pointz Graffiti and Street Art Museum which is now destroyed. So, the art at 5 Pointz is now sadly trashed. Or, is it we as society that are the trash? 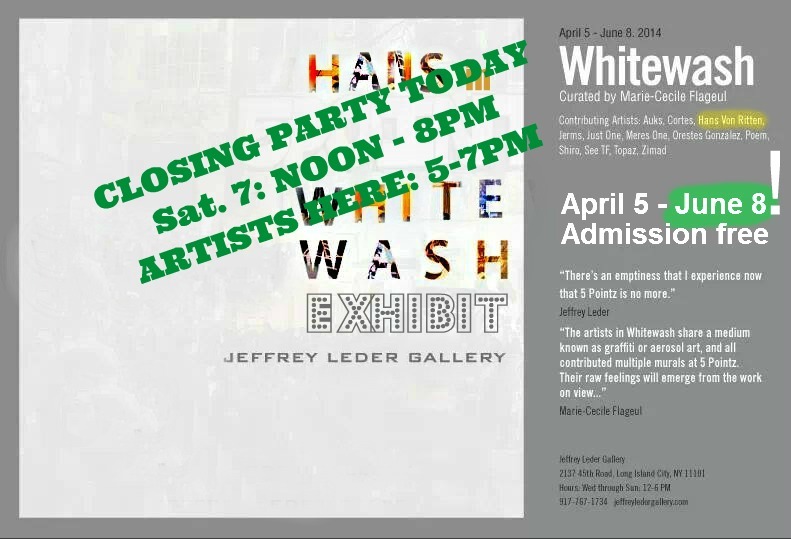 Come see the ‘Whitewash” exhibit at the Jeffrey Leder Gallery in it’s last days till June 8! Closing party Saurday June 7: 12 -8. LEDER GALLERY: 2137 45th Road, L.I.C. Here is an excerpt from an interview on Francisco de Pájaro from the blog: ‘Street Art Mecca’: “Francisco speaks about the absurdity in society, our hideous selfishness, our capacity for self destruction and our ridiculous behaviour towards weaknesses. 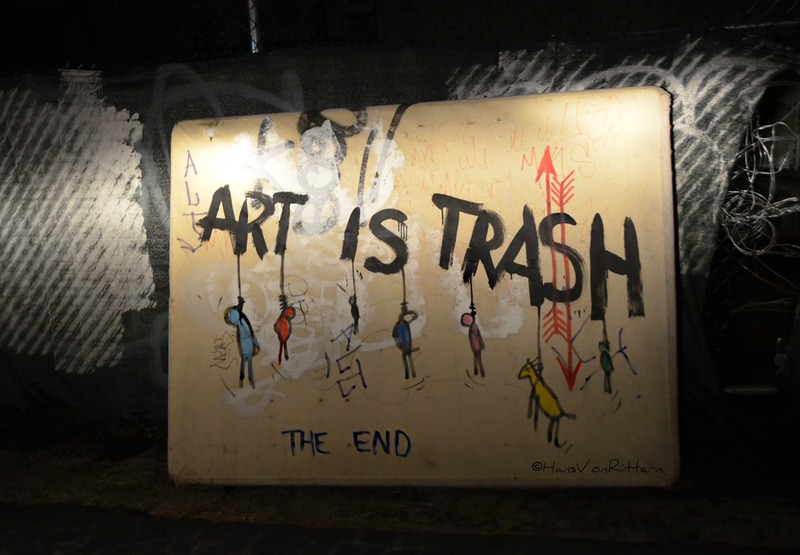 Pajaro’s “Art is Trash” speaks directly at you and says “you are the art, the lie and the trash of society”, and we love him for it. I realised in hindsight that he is just as wonderfully satirical and humorous in conversation as his art is on the street. He sees society with the stark reality you find in many great artists. He points out our imperfections and makes us laugh at them. He converts our waste into grotesque reminders about who we are and what we do. His style of art might be named naive if it wasn’t so harsh to look at. The gallery is on the street, among our discarded belongings that we so often like to ignore. On previous mini filming excursions with Pajaro I noted that the artwork doesn’t last long on the streets. In Barcelona there are specific nights when people can put any type of trash on the streets. Each neighbourhood has it’s own day and we met in Gracia on a Tuesday. It doesn’t take long to find an attractive pile of crap and he gets to work. The street is dark and desolate and there’s only Pakistani immigrants competing for recyclables. They stop and watch the performance. One couple walk past and recognise him from “that documentary”. On a different occasion I’ve seen people take some of the art as soon as we leave. “It’s a Barcelona thing” says one neighbour, as he takes a mini monster sculptor back into his house. Each piece is unique. Each piece is improvised on the street, in the moment. 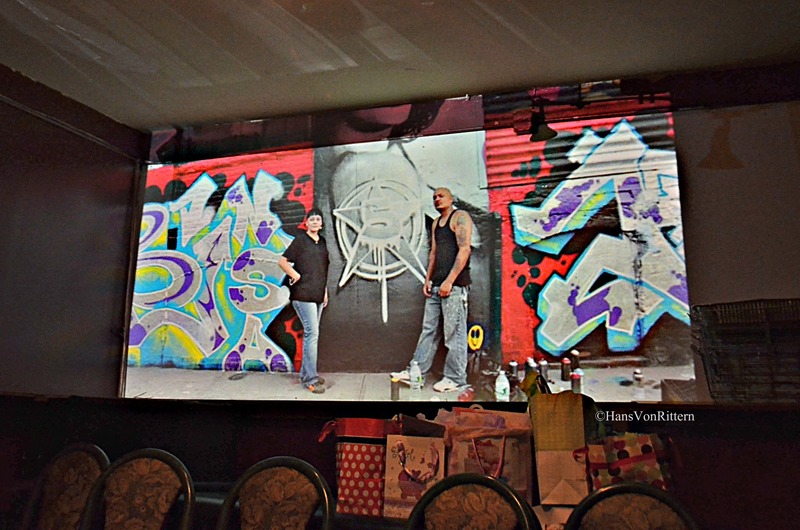 Each piece has the shortest of life spans, much shorter than other types of street art. Each piece interacts with the environment and creates a new perspective. There’s no catch, it’s pure street art. It’s rebellious and punk. The motivation is sincere also, to communicate with everyone. To make you think, to make you smile or laugh. To bring something new to the routine of everyday life. There’s nothing on sale, no money is involved. Art is Tra$h: Nobody can put me down. Photo of the day: COME SEE THE LIGHT – The Cathedral-like light of what once was 5 Pointz can be in seen in one of my many photographs at our current ‘Whitewash’ exhibit ending this Sunday June 8. 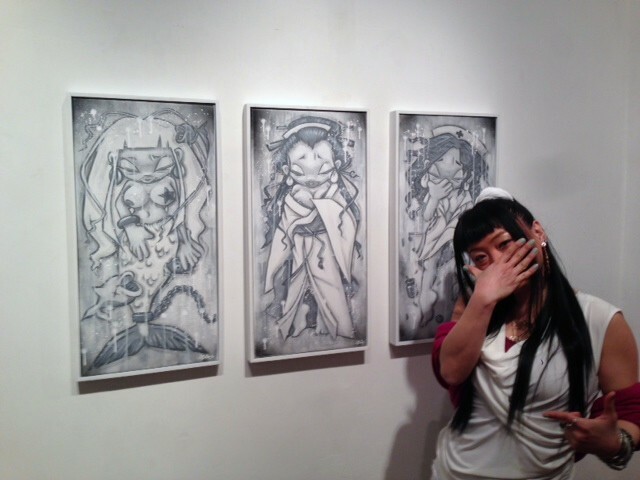 Closing party to beheld this Saturday from noon till 8pm, please join me and my friends! #7/G subway stop. One block away from 5 Pointz and PS1 Moma. Admission is free, open 12-6. 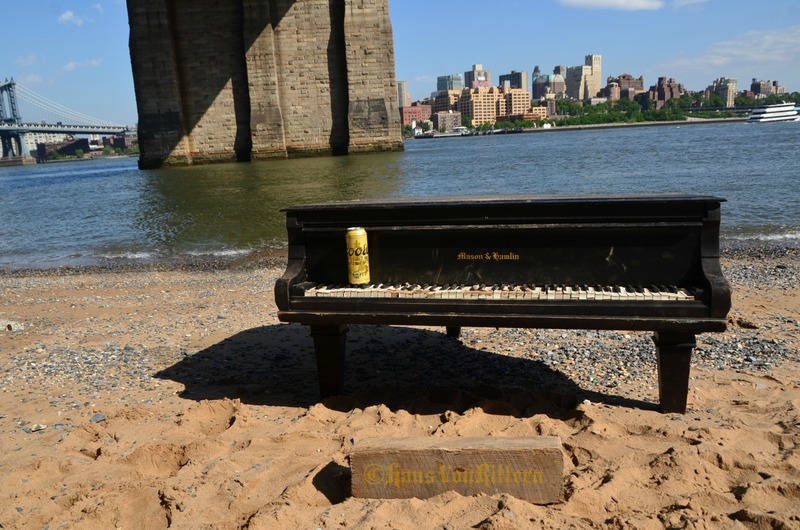 Photo of the day: EBB TIDE CONCERTO – The most talked about piano in New York is not Billy Joel’s, Liberace’s or Elton John’s – it’s the old Mason and Hamlin piano that mysteriously appeared on the East River shore of the Brooklyn Bridge sometime last week. At high tide the piano is almost completely submerged, at low tide it has become quite a tourist and photographer’s attraction. Who knew something so simple, old and decrepit could cause so much fun?! Mason & Hamlin was founded by Henry Mason who was a direct descendent of the pilgrims of the Mayflower – so it is somewhat cyclical that this piano winds up in the Atlantic Ocean. There are three main theories as to how this heavy baby grand piano landed in the river: 1) It was used for a photo shoot and was just too heavy and old to remove afterwards. 2) It was a garbage dump since some locals claim they say it tossed on it’s side just by the river walkway’s gate. 3) My friend Marie Flageul has the best theory as to it’s origin. She is convinced it is the piano from the Sequoia Restaurant that was part of South Street Seaport’s Pier 17 that is now disgracefully and disrespectfully being torn down. It could not have been snatched from the dumpsters since they are all guarded behind closed gates, so . . . was it construction workers in a humorous mood? We will never know. Both the Sanitation Department, the Department of Environmental Protection and the Parks Department all claim it is not their jurisdiction. The curiosity now remains how long it will take for the Atlantic ocean to claim it’s serenade to sea. In 1854, two brilliant idealists, Henry Mason and Emmons Hamlin, founded the Mason & Hamlin Company in Boston, Massachusetts, the birthplace of American piano design and manufacturing. Although their backgrounds and interests were very different, the two men shared a common goal: to make the world’s finest musical instruments. Henry Mason was a member of one of America’s oldest families—they were actually descendents of pilgrims who arrived on the Mayflower. The Masons were renowned for their involvement in the arts. Henry Mason was a pianist and his brother, William, was one of America’s foremost classical pianists and composers. Their father was the famous composer and educator Lowell Mason, a visionary who was the first to bring music into the public schools of America. He was also known throughout the world as a composer and publisher of hymns, and is often called the “father of American church music.” Henry Mason shared his father’s lifelong dedication to music. Emmons Hamlin was not a musician, but instead a brilliant mechanic and inventor. While working at the melodeon factory of George A. Price and Company of Buffalo, Hamlin invented a way to voice organ reeds, so that they could imitate the sound of a clarinet, violin or other musical instruments. 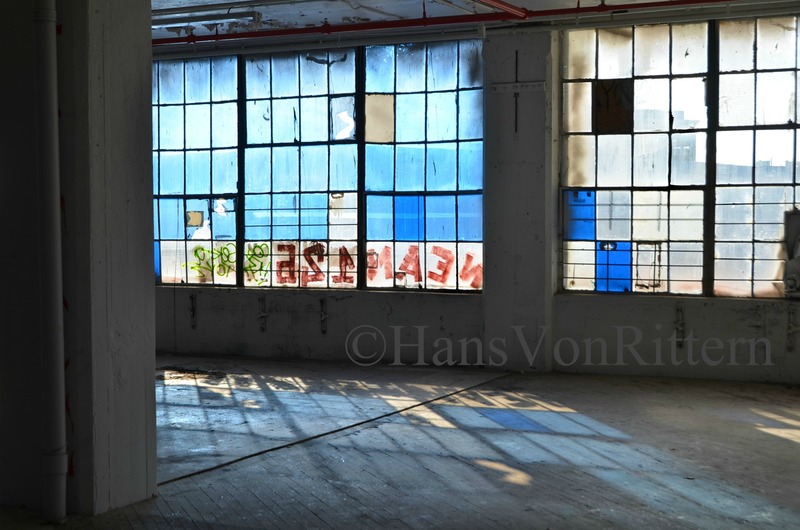 Photo of the day: ‘EMPTY’ BY HANS VON RITTERN – Don’t let June pass you by with that “Empty” feeling. Only 9 more days to see our ‘Whitewash” exhibit! This photo is one of my 16 photos on display and has already been sold to one of the men in the photo. The photo was taken the day of the whitewash, I noticed these two guys where just standing there for at least a half an hour, silent, motionless – just dumbstruck by the vandalistic act. The title ‘Empty’ says it all, how we felt, they felt and we all still feel to this day. #G subway stop to Court Square. #7 train is not running this weekend but shuttle service is available from #N/Q trains at Queensboro Plaza. One block away from 5 Pointz and PS1 Moma. Admission is free, open 12-6. Photo of the day: FROZEN by SHIRO, 5 POINTZ WHITEWASH EXHIBIT THIS WEEKEND – One of the most beloved 5 Pointz artists is Shiro of Japan. I am delighted to also call her a friend. Two of the most iconic figures that represent 5 Pointz to this day are Meres One’s iconic light bulbs and Shiro’s Japan girls. For our current Whitewash exhibit, artists decided to represent their feelings in one of two ways – either to express their feeling through expressive paintings or to simply recreate one of their 5 Pointz murals. Shiro aka Shoko Mikami has decided to do both in recreating some of her iconic Japan-anime figures. The only thing now different is they are frozen and violated, the mermaid has been caught and chained, the geisha girl has been raped and the nurse has been poisoned. This is how most of us feel about the destruction of this iconic place. If you would like to see more expressions by great artists on canvas and in photographs (mine included) this weekend – come to the Jeffrey Leder Gallery this weekend and view the brilliant art by artists: Auks, Cortes, Hans Von Rittern, Jerms, Just One, Meres One, Poem, Shiro, See TF, Topaz, Zimad, all brilliantly curated by Marie Cecile Flageul! The Jeffrey Leder Gallery: 2137 45th Road, L.I.C. #7/G subway stop. One block away from 5 Pointz and PS1 Moma. Admission is free, open 12-6. 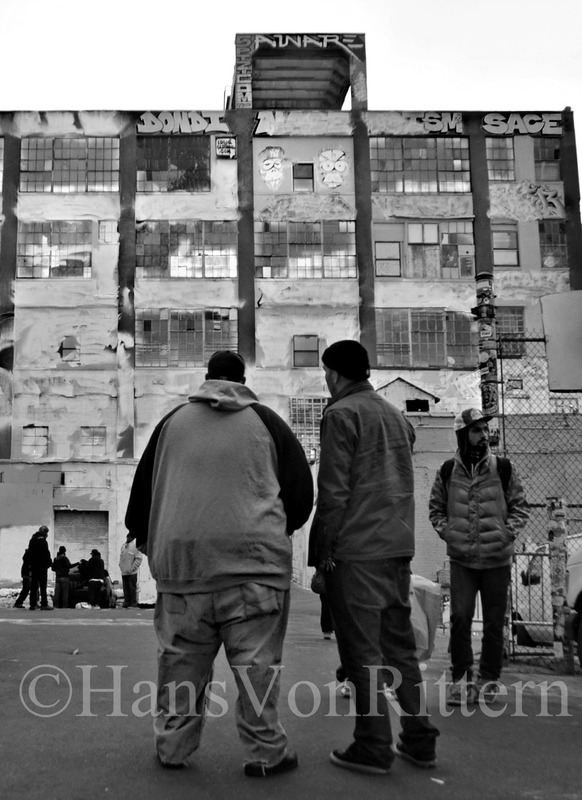 Photo of the day: DISCUSSION TODAY 6pm ‘THE IMPORTANCE OF PUBLIC ART’ at JEFFREY LEDER GALLERY – Come join me and the artists of 5 Pointz to discuss the ever growing importance of public art in our cities and culture. ‘Street art’ gives our… communities their identity, brightens blighted areas, gives pride and keeps the flavor of the neighborhood. Come join us! 6pm. 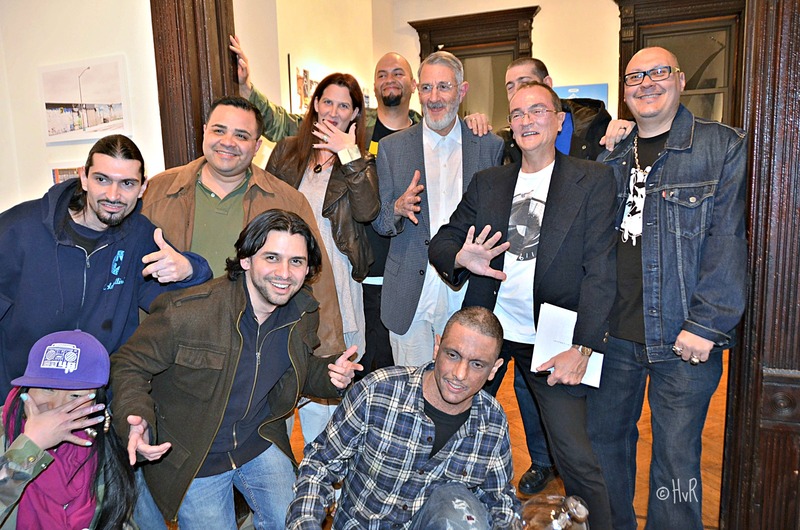 If you would like to hear more expressions by great artists tonight – come to the Jeffrey Leder Gallery tonight and view and hear the awesome artists: Auks, Cortes, Hans Von Rittern, Jerms, Just One, Meres One, Poem, Shiro, See TF, Topaz, Zimad, all brilliantly curated by Marie Cecile Flageul! #7/G subway stop. One block away from 5 Pointz and PS1 Moma. Admission is free, open 6 to 9pm. Photo of the day: HEAVY CONSCIENCE by AUKS/5 POINTZ – One of the thought inducing powerful photos part of the current ‘Whitewash” exhibit in memory of the vandalistic destruction of the great murals at 5 Pointz Graffiti and Street Art Museum. I am proud to say I have one of Auk’s amazing paintings in my home. 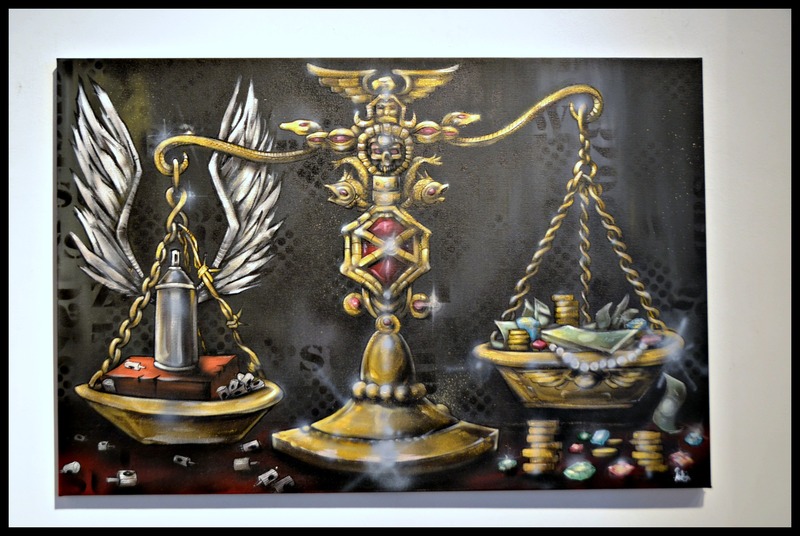 “Auks One” (Thomas Lucero), an artist who draws much of his inspiration from Chicano tattoo art, cartoons, skateboard graphics, and later Hip Hop culture and high Renaissance drawings. He is a self-taught artist who has worked diligently over the years to refine his skills in every form of artistic expression. He is best known for his graffiti inspired illustrations and murals and his work has inevitably spread to the gallery circuit. The art lives on! Currently at The Jeffrey Leder Gallery in form of the ‘Whitewash” exhibit, just one block over at 2137 45th Road in 5 Pointz, come pay your respects and enjoy!